Central New England Equine Rescue, Inc. I am one of the volunteers on the Board at Central New England Equine Rescue and we had intercepted this underweight and overworked horse a week before his appointment with a slaughter house. Nobody wanted a 19 year old draft horse whose only flaw was not being accustomed to Boston’s hectic street traffic and sirens. The trailer swayed back and forth as he methodically moved his hooves closer and closer to the end of the trailer. He stepped down and it was clear he was underweight. His life had not been a gentle one. The face bore the brunt of the scarring. He had black skin on his nose, where no white hair was growing because the hair shafts were worn away from sweat and a bridle that had been too tight for too long. The sides of his jaws bore the same odd scarring; as he turned I could see the scars left on his barrel from ill fitting harnesses. His large brown eyes took the view in and settled on me. As I looked back into those eyes I could see a bit of hope remained but it had been buried deep, long ago. He held no hate, no resentment just apprehension at what shoe would be dropping next. I was totally enthralled with this giant among horses. The transporter interrupted this moment when he spoke and I was brought back to the real world. I paid the man who had delivered the Percheron X, and Monty was brought to his stall. He would be staying at the Rescue’s Oakham barn until a stall opened up at the Warren barn. We could not even imagine how this boy would uplift the entire Rescue in the months ahead. The thoughts started forming in my mind of what kind of a human being would allow this? How much more would it have cost an owner to have purchased a bridle that would have fit him, not hurt him....$50? $150? This pain could have been avoided for very little. 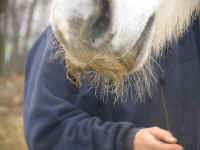 These draft horses are expected to work long, hard hours and even with regulations, many work longer than they ought to. Walking in the stench of the fumes from traffic every single day causes them to have breathing problems later in life and the constant walking on pavement causes leg problems. They work in 18 degree weather in the winter month’s and in sweltering heat over 90 degrees in the summer months. There is no romance for the horse that pulls the hansom cab while the passengers sit and talk. My mind started remembering the articles that I had read about accidents with these horses on the streets of New York City and Boston. I did a shudder as I thought of the sight of a horse meeting metal in the streets. I wanted, at that moment, to free every carriage horse from its death sentence to work in the cities. Let me go back to what started this meeting with Monty. I am charged with answering emails from our website, “Central New England Equine Rescue.com”, on this particular day I read an email asking if we could help a Boston carriage horse that was doomed to go to slaughter in two weeks. I was going to answer this email and let this kind hearted soul know that there wasn’t one stall left open as we had just taken on the responsibility of an additional six Standardbreds that had been abandoned in Connecticut, but something inside told me to ask more questions about this horse. I received a prompt reply stating that this Draft horse was 19 years old, his body was scarred but he was a lovely boy. He had come from the Amish in Pennsylvania where he had pulled a plow most of his life; ended up at the auction block and was purchased by a Boston Carriage owner/operator. (Emphasis on operator!). This horse was expected to go from a rural hard life to a city life and not skip a beat. He adjusted better than I could have but he was slow moving pulling the carriages thus cutting into the profits that could be made from a faster moving horse. He also was afraid of the sirens that zoomed by him. He was not working out as a Boston carriage horse. He was put in the Rockport stable to be sold and if not sold he would go to slaughter. After an entire life of service to man, it was a death sentence that would take place in two short weeks. The owner would pay no more on his board. That is when the angel appeared. She gave this horse (who didn’t even have a name) extra treats at night and groomed him quietly when no one was around. What a comfort to a horse that was exhausted, underweight and lacking human kindness. He responded to her and she in turn was determined to help him find a way out of this misery. She gave him the name of Ambassador Montague and called him Monty for short. That’s when she sent emails to area rescues. She told us later that we were the only one that responded. How grateful she was that we did. She explained the situation in detail over the next few days and encouraged the decision making process by letting us know that Monty was a gentle soul who stayed to himself, that he bothered no other horses in the field. She also stated that he had such a sad and almost worried look in his eyes. The board members of the rescue voted to take Monty in. Abbie, an older mare in the rescue, had found a foster family so there would be room to care for Monty after all. The Rescue started right into fund raising to purchase Monty. Friends and co-workers heard of Monty’s plight and started donating $5’s, $10’s and whatever they could. The angel from the Rockport barn rallied her friends and they donated the bulk of his purchase price which was $800. We had asked if the owner/operator would consider donating Monty to the rescue rather than send him to slaughter and the answer was a sad statement of the way it is for the horses. The answer that was delivered without tact was that Monty was worth 40 cents per pound and he weighed approximately 2000lbs, making him worth $800 at the slaughter house. So whether we paid it or the slaughter house paid it, he would get his $800. Sometimes you just take a chance and it all works out right. Monty is a very gentle soul that can melt your heart by just standing next to him. He has charisma! The sadness and worry that he once had in his eyes when he came into the Rescue is all but gone. 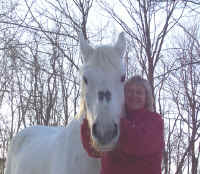 He was our ambassador at the Equine Affaire in West Springfield in 2005. His presence in Barn C was astounding. So many Affaire goers had heard his story and were drawn to come and see this beautiful horse that barely escaped slaughter. They were not disappointed when they met Monty. No one ever is. His walk is a graceful and purposeful sachet; his trot is magnificent and when he canters the earth thunders. We all thought that we were being benevolent to take Monty in; when in truth how blessed and grateful we are he came. “………………….. I then knew I wanted to help but knew I couldn’t afford to adopt one nor could I afford to pay for the care of one per month until he/she got adopted. I asked what an approximate cost would be per month to care for just one horse. I just knew I could get a few friends to feel the same way I did and could convince them to help just one horse and to help “make a difference one horse at a time”. The next thing I knew there was a carriage horse that needed to be rescued from going to the slaughterhouse. I was so taken aback by the pictures of this carriage horse and the story that went along with him, I decided that now would be a good time to enlist the help of my friends to see if we could help with his care each month. When my friends heard the same story I did, and viewed his pictures we all decided that we could give up something each week to pay the rescue $25/month for a total of $150 from all of us. We have all been doing this for a few months now and none of us has regretted a single moment and have taken turns buying carrots, apples and whatever else we can afford to help these beautiful horses. I’ll never forget the first time I saw Monty. I was so intimidated by him that I had to stand back and watch from a distance. I wanted so badly to walk with him or be near him but he was so big and I was so afraid of being stepped on, or knocked over I decided I better get to know him better and watch him. I’m sure he felt the same way about me wondering if I was going to hurt him and what was I doing there. One weekend you decided it would be a great idea if I got to sit on him. I just didn’t think this was a good idea at all especially since he’s always been a carriage horse and how would he like someone on his back? Well the next thing I know I’m climbing on a ladder and I found myself perched on top of his back while he’s chomping on a snack and not phased in the least that I was there. I felt almost terrified because I still didn’t feel like I knew him yet and was afraid he would run off or try to dump me but he didn’t. I was so nervous everytime he took a little step I couldn’t stop babbling my nervous jibber jabber which in turn made you laugh. As the weeks went by I got up more courage to get close to him and couldn’t get over how huge his head was and how I felt like I had to stand on something to touch his neck. Everytime I looked at him I wanted to cry as the most visible scars are on his face, and the side of his face where many years of wearing a bridle that didn’t fit properly, sweating, and who knows what else had worn away the hair so badly that it’s now tender to touch. The sadness in his eyes were leaving a lasting stamp in my mind as I drove home each weekend and would be the last thing I would see when I went to bed. I just couldn’t stop wondering what sort of life has he had for the last 20 years??? If only he could tell me although I felt it through the look in his eyes. Each Monday would make me so anxious to get to Friday so that I could make plans to get back to the farm to see him. Each weekend you would encourage me to take him out of his stall and bring him to the pasture. Once I did that I realized that he’s the most gentle soul, the sweetest most loving and kind large animal I have ever come in contact with. He truly is a “Gentle Giant” and the people that coined that phrase knew what they were talking about. Everything he does is almost like watching a movie in slow-motion. Absolutely so graceful and each step is so carefully placed. His trot is the most beautiful thing to watch and when he canters you never get tired of watching him. He looks so happy and to everyone watching looks like a giant rocking horse moving so slowly and beautifully. Every time I see him, I’m so thankful for the person(s) responsible for saving his life and bringing him into mine! I have learned so much from him and he makes me feel so renewed and happy to be alive. There’s a purpose now and he’s it!! He has brought old friends back together, enabled us to make new ones and has gained popularity from the West Coast and the Southwest part of the country. Monty will remain at the rescue the rest of his days as part of our Educational Program. Making a Difference One Horse at a Time!